a. An independence referendum was held on December 1, after which Ukrainian independence was finalized on December 26. The current constitution was adopted on June 28, 1996. Ukraine ( /juːˈkreɪn/ yew-KRAYN-'; Ukrainian: Україна|, transliterated: Ukrayina, [ukrɑˈjinɑ]) is a country in Eastern Europe. Ukraine borders the Russian Federation to the east and northeast, Belarus to the northwest, Poland, Slovakia and Hungary to the west, Romania and Moldova to the southwest, and the Black Sea and Sea of Azov to the south and southeast, respectively. It has an area of 603,628 km², making it the second largest contiguous country on the European continent, after the Russian Federation. A chaotic period of incessant warfare ensued, with several internationally recognized attempts to achieve independence from 1917 to 1921, and following World War I and the Russian Civil War. Ukraine emerged from its own civil war, and on December 30, 1922 Ukrainian Soviet Socialist Republic became one of the founding republics of the Soviet Union. The Ukrainian SSR's territory was enlarged westward during the civil war shortly before and after World War II. In 1954 it expanded to the south with the Crimea transfer. In 1945, the Ukrainian SSR became one of the founding members of the United Nations. Ukraine became independent again when the Soviet Union dissolved in 1991. This dissolution started a period of transition to a market economy, in which Ukraine suffered an eight-year recession. Since then, however, the economy has experienced a high increase in GDP growth. Ukraine was caught up in the worldwide economic crisis in 2008 and the economy plunged. GDP fell 20% from spring 2008 to spring 2009, then leveled off as analysts compared the magnitude of the downturn to the worst years of economic depression during the early 1990s. The country remains a globally important market and, as of 2011, is the world's third-largest grain exporter. Ukraine is a unitary state composed of 24 oblasts (provinces), one autonomous republic (Crimea), and two cities with special status: Kiev, its capital and largest city, and Sevastopol, which houses the Russian Black Sea Fleet under a leasing agreement. Ukraine is a republic under a semi-presidential system with separate legislative, executive, and judicial branches. Since the dissolution of the Soviet Union, Ukraine continues to maintain the second-largest military in Europe, after that of Russia. The country is home to 46 million people, 77.8 percent of whom are ethnic Ukrainians, with sizable minorities of Russians (17%), Belarusians and Romanians. Ukrainian is the official language of Ukraine. Russian is also widely spoken. The dominant religion in the country is Eastern Orthodox Christianity, which has strongly influenced Ukrainian architecture, literature and music. The traditional view (mostly influenced by Russian and Polish historiography) on the etymology of Ukraine is that it came from the old Slavic term ukraina which meant "border region" or "frontier" and thus corresponded to the Western term march. The term can be often found in Eastern Slavic chronicles from 1187 on, but for a long time it referred not solely to the border lands in present-day Ukraine. The plural term ukrainy was used as well in the Grand Duchy of Moscow as in the Grand Duchy of Lithuania. In the 16th and 17th centuries, this term was applied to the lands across the border to the nomad world (Crimean Khanate). Frequent raids from the steppe made life in such regions a special and dangerous challenge. With the migration of the Great Abatis Belt southwards, the application of the term switched to Sloboda Ukraine and then to Central Ukraine. Over time it gained an ethnic meaning, as applied to the local South Rus' (Little Russia in the ecclesiastic and the imperial Russian terminology). Many contemporary Ukrainian historians translate the term "u-kraine" as "in-land", "home-land" or "our-country". This translation is in accordance with the original Ukrainian language meaning of preposition "у-" (u-) and noun "країна" (krayina). The accompanying claim that it always had a strictly separate meaning to "borderland" (ukraina vs. okraina) is considered inconsistent with a number of historical sources, often of other than Ukrainian origin. The translation as "borderland" agrees with the traditional Russian-language meaning of "у-" (u-) and "краина" (kraina). Though the form "the Ukraine" was once the more common term in English, it has become less accepted after the government officially dropped the article 'the' in 1993. Most sources have since dropped the article in favour of simply "Ukraine". Kievan Rus' was founded by the Rus' people, Varangians who first settled around Ladoga and Novgorod, then gradually moved southward eventually reaching Kiev about 880. Kievan Rus' included the western part of modern Ukraine, Belarus, with larger part of it situated on the territory of modern Russia. According to the Primary Chronicle the Rus' elite initially consisted of Varangians from Scandinavia. Map of the Kievan Rus' in the 11th century. During the Golden Age of Kiev, the lands of Rus' covered modern western, central and northern Ukraine, Belarus, and western Russia. Modern eastern and southern Ukraine were inhabited by nomads and had a different history. The Varangians later assimilated into the local Slavic population and became part of the Rus' first dynasty, the Rurik Dynasty. Kievan Rus' was composed of several principalities ruled by the interrelated Rurikid Princes. The seat of Kiev, the most prestigious and influential of all principalities, became the subject of many rivalries among Rurikids as the most valuable prize in their quest for power. In the 11th and 12th centuries, constant incursions by nomadic Turkic tribes, such as the Pechenegs and the Kipchaks, caused a massive migration of Slavic populations to the safer, heavily forested regions of the north. The 13th century Mongol invasion devastated Kievan Rus'. Kiev was totally destroyed in 1240. On today's Ukrainian territory, the state of Kievan Rus' was succeeded by the principalities of Halych and Volodymyr-Volynskyi, which were merged into the state of Galicia-Volhynia. In the mid-14th century, Casimir III of Poland gained control of Galicia-Volhynia, while the heartland of Rus', including Kiev, became the territory of the Gediminas, of the Grand Duchy of Lithuania, after the Battle on the Irpen' River. Following the 1386 Union of Krewo, a dynastic union between Poland and Lithuania, much of what became northern Ukraine was ruled by the increasingly Slavicised local Lithuanian nobles as part of the Grand Duchy of Lithuania. By 1569, the Union of Lublin formed the Polish–Lithuanian Commonwealth, and a significant part of Ukrainian territory was moved from Lithuanian rule to the Crown of the Kingdom of Poland, thus becoming Polish territory. Under the cultural and political pressure of Polonisation, many upper-class people of Polish Ruthenia (another term for the land of Rus) converted to Catholicism and became indistinguishable from the Polish nobility. Thus, the commoners, deprived of their native protectors among Rus nobility, turned for protection to the Cossacks, who remained fiercely Orthodox. The Cossacks tended to turn to violence against those they perceived as enemies, particularly the Polish state and its representatives. In the mid-17th century, a Cossack military quasi-state, the Zaporozhian Host, was established by the Dnieper Cossacks and the Ruthenian peasants fleeing Polish serfdom. Poland had little real control of this land, yet they found the Cossacks to be a useful fighting force against the Turks and Tatars, and at times the two allied in military campaigns. However, the continued enserfment of peasantry by the Polish nobility, emphasized by the Commonwealth's fierce exploitation of the workforce, and most importantly, the suppression of the Orthodox Church pushed the allegiances of Cossacks away from Poland. The Cossacks aspired to have representation in Polish Sejm, recognition of Orthodox traditions and the gradual expansion of the Cossack Registry. These were all vehemently rejected by the Polish nobility, who had power in the Sejm. The Cossacks eventually turned for protection to Orthodox Russia, a decision which would later lead towards the downfall of the Polish–Lithuanian state, and the preservation of the Orthodox Church and in Ukraine. In 1648, Bohdan Khmelnytsky led the largest of the Cossack uprisings against the Commonwealth and the Polish king John II Casimir. 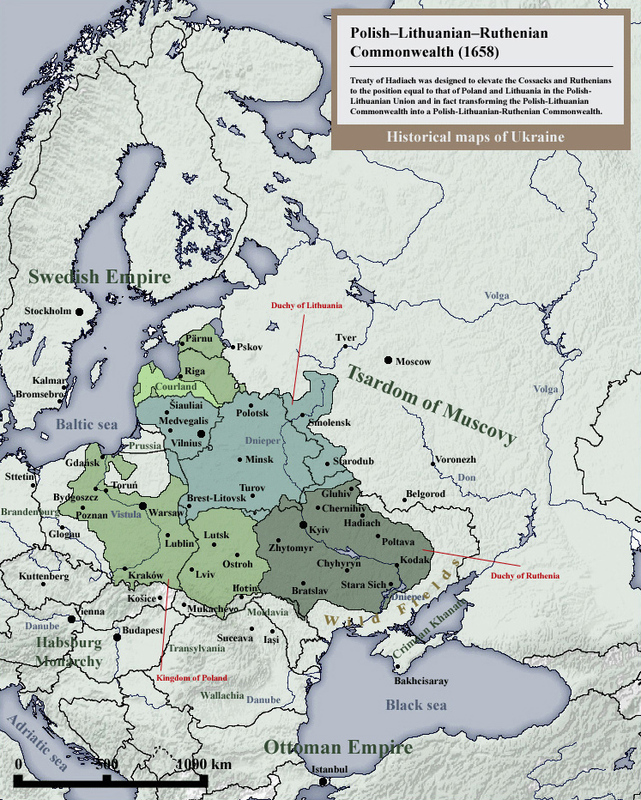 Left-bank Ukraine was eventually integrated into Muscovite Russia as Rada faced the alternatives of subjection to Poland, allegiance to Turkey, or allegiance to Muscovy and chose the latter as the Cossack Hetmanate as recorded in the 1654 Treaty of Pereyaslav. There followed the Russo-Polish War which ended in 1667. After the partitions of Poland at the end of the 18th century by Prussia, Habsburg Austria, and Russia, Western Ukrainian Galicia was taken over by Austria. The Crimean Khanate was one of the strongest powers in Eastern Europe until the 18th century; at one point it even succeeded, under the Crimean khan Devlet I Giray, to devastate Moscow. The Russian population of the borderlands suffered annual Tatar invasions and tens of thousands of soldiers were required to protect the southern boundaries. From the beginning of the 16th century until the end of 17th century the Crimean Tatar raider bands made almost annual forays into agricultural Slavic lands searching for captives to sell as slaves. According to Orest Subtelny, "from 1450 to 1586, eighty-six Tatar raids were recorded, and from 1600 to 1647, seventy." In 1688, Tatars captured a record number of 60,000 Ukrainians. This was a heavy burden for the state, and slowed its social and economic development. Since Crimean Tatars did not permit settlement of Russians to southern regions where the soil is better and the season is long enough, Muscovy had to depend on poorer regions and labour-intensive agriculture. Poland-Lithuania, Moldavia and Wallachia were also subjected to extensive slave raiding. The Crimean Khanate was conquered by the Russian Empire in 1778, bringing an end to the last Tatar state. In 1657–1686 came "The Ruin," a devastating 30-year war amongst Russia, Poland, Turks and Cossacks for control of Ukraine, which occurred at about the same time as the Deluge of Poland. For three years, Khmelnytsky's armies controlled present-day western and central Ukraine, but, deserted by his Tatar allies, he suffered a crushing defeat at Berestechko, and turned to the Russian tsar for help. The hetmanate was abolished in 1764; the Zaporizhska Sich abolished in 1775, as Russia centralized control over its lands. As part of the partitioning of Poland in 1772, 1793, and 1795, the Ukrainian lands west of the Dnieper were divided between Russia and Austria. From 1737 to 1834, expansion into the northern Black Sea littoral and the eastern Danube valley was a cornerstone of Russian foreign policy. Lithuanians and Poles controlled vast estates in Ukraine, and were a law unto themselves. Judicial rulings from Cracow were routinely flouted, while peasants were heavily taxed and practically tied to the land as serfs. Occasionally the landowners battled each other using armies of Ukrainian peasants. The Poles and Lithuanians were Roman Catholics and tried with some success to convert the Orthodox lesser nobility. In 1596 they set up the "Greek-Catholic" or Uniate Church, under the authority of the Pope but using Eastern rituals; it dominates western Ukraine to this day. Tensions between the Uniates and the Orthodox were never resolved, and the religious differentiation left the Ukrainian Orthodox peasants leaderless, as they were reluctant to follow the Ukrainian nobles. Cossacks led an uprising, called Koliivshchyna, starting in the Ukrainian borderlands of the Polish–Lithuanian Commonwealth in 1768. Ethnicity as one root cause of this revolt, which included Ukrainian violence that killed tens of thousands of Poles and Jews. Religious warfare also broke out between Ukrainian groups. Increasing conflict between Uniate and Orthodox parishes along the newly reinforced Polish-Russian border on the Dnepr River in the time of Catherine II set the stage for the uprising. As Uniate religious practices had become more Latinized, Orthodoxy in this region drew even closer into dependence on the Russian Orthodox Church. Confessional tensions also reflected opposing Polish and Russian political allegiances. After the Russians annexed the Crimean Khanate in 1783, the region was settled by Ukrainian and Russian migrants. Despite the promises of Ukrainian autonomy given by the Treaty of Pereyaslav, the Ukrainian elite and the Cossacks never received the freedoms and the autonomy they were expecting from Imperial Russia. However, within the Empire, Ukrainians rose to the highest Russian state and church offices. [a] At a later period, tsarists established a policy of Russification of Ukrainian lands, suppressing the use of the Ukrainian language in print, and in public. After Ukraine and Crimea became aligned with the Russian Empire Russo-Turkish War (1768–1774), significant German immigration occurred after it was encouraged by Catherine the Great and her immediate successors. Immigration was encouraged into Ukraine and especially the Crimea by Catherine in her proclamation of open migration to the Russian Empire. Immigration was encouraged for Germans and other Europeans to thin the previously dominant Turk population and encourage more complete use of farmland. Beginning in the 19th century, there was a continuous migration from Ukraine to settle the distant areas of the Russian Empire. According to the 1897 census, there were 223,000 ethnic Ukrainians in Siberia and 102,000 in Central Asia. Between 1896 and 1906, after the construction of the trans-Siberian railway, a total of 1.6 million Ukrainians migrated eastward. Ukrainians entered World War I on the side of both the Central Powers, under Austria, and the Triple Entente, under Russia. 3.5 million Ukrainians fought with the Imperial Russian Army, while 250,000 fought for the Austro-Hungarian Army. During the war, Austro-Hungarian authorities established the Ukrainian Legion to fight against the Russian Empire. This legion was the foundation of the Ukrainian Galician Army that fought against the Bolsheviks and Poles in the post World War I period (1919–23). Those suspected of Russophile sentiments in Austria were treated harshly. Up to 5,000 supporters of the Russian Empire from Galicia were detained and placed in Austrian internment camps in Talerhof, Styria, and in a fortress at Terezín (now in the Czech Republic). When World War I ended, several empires collapsed; among them were the Russian and Austrian empires. The Russian Revolution of 1917 ensued, and a Ukrainian national movement for self-determination reemerged, with heavy Communist/Socialist influence. During 1917–20, several separate Ukrainian states briefly emerged: the Ukrainian People's Republic, the Hetmanate, the Directorate and the pro-Bolshevik Ukrainian Soviet Socialist Republic (or Soviet Ukraine) successively established territories in the former Russian Empire; while the West Ukrainian People's Republic and the Hutsul Republic emerged briefly in the former Austro-Hungarian territory. This led to civil war, and an anarchist movement called the Black Army led by Nestor Makhno developed in Southern Ukraine during that war. However, Poland defeated Western Ukraine in the Polish-Ukrainian War, but failed against the Bolsheviks in an offensive against Kiev. According to the Peace of Riga concluded between the Soviets and Poland, western Ukraine was officially incorporated into Poland, who in turn recognised the Ukrainian Soviet Socialist Republic in March 1919. Ukraine became a founding member of the Union of Soviet Socialist Republics or the Soviet Union in December 1922. Soviet recruitment poster featuring the Ukrainisation theme. The text reads: "Son! Enroll in the school of Red commanders, and the defence of Soviet Ukraine will be ensured." The civil war that eventually brought the Soviet government to power devastated Ukraine. It left over 1.5 million people dead and hundreds of thousands homeless. In addition, Soviet Ukraine had to face the famine of 1921. Seeing an exhausted Ukraine, the Soviet government remained very flexible during the 1920s. Thus, under the aegis of the Ukrainization policy pursued by the national Communist leadership of Mykola Skrypnyk, Soviet leadership encouraged a national renaissance in literature and the arts. The Ukrainian culture and language enjoyed a revival, as Ukrainisation became a local implementation of the Soviet-wide policy of Korenisation (literally indigenisation) policy. The Bolsheviks were also committed to introducing universal health care, education and social-security benefits, as well as the right to work and housing. Women's rights were greatly increased through new laws designed to wipe away centuries-old inequalities. Most of these policies were sharply reversed by the early 1930s after Joseph Stalin gradually consolidated power to become the de facto communist party leader. The communists gave a privileged position to manual labor, the largest class in the cities, where Russians dominated. The typical worker was more attached to class identity than to ethnicity. Although there were incidents of ethnic friction among workers (in addition to Ukrainians and Russians there were significant numbers of Poles, Germans, Jews, and others in the Ukrainian workforce), industrial laborers had already adopted Russian culture and language to a significant extent. Workers whose ethnicity was Ukrainian were not attracted to campaigns of Ukrainianization or de-Russification in meaningful numbers, but remained loyal members of the Soviet working class. There was no significant antagonism between workers identifying themselves as Ukrainian or Russian. Starting from the late 1920s, Ukraine was involved in the Soviet industrialisation and the republic's industrial output quadrupled during the 1930s. The famine claimed up to 10 million of Ukrainian lives as peasants' food stocks were forcibly removed by the Soviet government by the NKVD secret police. Some explanations for the causes for the excess deaths in rural areas of Ukraine and Kazakhstan during 1931–34 has been given by dividing the causes into three groups: objective non-policy-related factors, like the drought of 1931 and poor weather in 1932; inadvertent result of policies with other objectives, like rapid industrialization, socialization of livestock, and neglected crop rotation patterns; and deaths caused intentionally by a starvation policy. The Communist leadership perceived famine not as a humanitarian catastrophe but as a means of class struggle and used starvation as a punishment tool to force peasants into collective farms. It was largely the same groups of individuals who were responsible for the mass killing operations during the civil war, collectivisation, and the Great Terror. These groups were associated with Efim Georgievich Evdokimov (1891–1939) and operated in Ukraine during the civil war, in the North Caucasus in the 1920s, and in the Secret Operational Division within General State Political Administration (OGPU) in 1929–31. Evdokimov transferred into Communist Party administration in 1934, when he became Party secretary for North Caucasus Krai. But he appears to have continued advising Joseph Stalin and Nikolai Yezhov on security matters, and the latter relied on Evdokimov's former colleagues to carry out the mass killing operations that are known as the Great Terror in 1937–38. German armies invaded the Soviet Union on June 22, 1941, thereby initiating four straight years of incessant total war. The Axis allies initially advanced against desperate but unsuccessful efforts of the Red Army. In the encirclement battle of Kiev, the city was acclaimed as a "Hero City", because the resistance by the Red Army and by the local population was fierce. More than 600,000 Soviet soldiers (or one-quarter of the Western Front) were killed or taken captive there. Although the wide majority of Ukrainians fought alongside the Red Army and Soviet resistance, some elements of the Ukrainian nationalist underground created an anti-Soviet nationalist formation in Galicia, the Ukrainian Insurgent Army (1942). At times it allied with the Nazi forces and, after the war, continued to fight the USSR. Using guerrilla war tactics, the insurgents targeted for assassination and terror those who they perceived as representing, or cooperating at any level with, the Soviet state. In total, the number of ethnic Ukrainians who fought in the ranks of the Soviet Army is estimated from 4.5 million to 7 million. [d] The pro-Soviet partisan guerrilla resistance in Ukraine is estimated to number at 47,800 from the start of occupation to 500,000 at its peak in 1944; with about 50 percent being ethnic Ukrainians. Generally, the Ukrainian Insurgent Army's figures are very undependable, ranging anywhere from 15,000 to as much as 100,000 fighters. Initially, some western Ukrainians, who had only joined the Soviet Union in 1939 under pressure, hailed the Germans as liberators. But brutal German rule in the occupied territories eventually turned its supporters against them. Nazi administrators of conquered Soviet territories made little attempt to exploit the dissatisfaction of the Ukraine with Stalinist political and economic policies. Instead, the Nazis preserved the collective-farm system, systematically carried out genocidal policies against Jews, deported men to work in forced labour camps in Germany, and began a systematic depopulation of Ukraine (along with Poland) to prepare it for German colonisation. They blockaded the transport of food on the Kiev River. The vast majority of the fighting in World War II took place on the Eastern Front. It has been estimated that 93 percent of all German casualties took place on the Eastern Front. The total losses inflicted upon the Ukrainian population during the war are estimated between five and eight million, including over half a million Jews killed by the Einsatzgruppen, sometimes with the help of local collaborators. Of the estimated 8.7 million Soviet troops who fell in battle against the Nazis, 1.4 million were ethnic Ukrainians. [d][e] Victory Day is celebrated as one of ten Ukrainian national holidays. In 1945, the Ukrainian SSR became one of the founding members of the United Nations organization. The first Soviet computer, MESM, was built at the Kiev Institute of Electrotechnology and became operational in 1950. Postwar ethnic cleansing occurred in the newly expanded Soviet Union. As of January 1, 1953, Ukrainians were second only to Russians among adult "special deportees", comprising 20% of the total. In addition, over 450,000 ethnic Germans from Ukraine and more than 200,000 Crimean Tatars were victims of forced deportations. Soviet Ukraine soon became a European leader in industrial production, and an important center of the Soviet arms industry and high-tech research. Such an important role resulted in a major influence of the local elite. Many members of the Soviet leadership came from Ukraine, most notably Leonid Brezhnev. He later ousted Khrushchev and became the Soviet leader from 1964 to 1982. Many prominent Soviet sports players, scientists, and artists came from Ukraine. On April 26, 1986, a reactor in the Chernobyl Nuclear Power Plant exploded, resulting in the Chernobyl disaster, the worst nuclear reactor accident in history. This was the only accident to receive the highest possible rating of 7 by the International Nuclear Event Scale, indicating a "major accident", until the Fukushima Daiichi nuclear disaster in March 2011. At the time of the accident, 7 million people lived in the contaminated territories, including 2.2 million in Ukraine. Although the idea of an independent Ukrainian nation had previously not existed in the 20th century in the minds of international policy makers, Ukraine was initially viewed as a republic with favorable economic conditions in comparison to the other regions of the Soviet Union. However, the country experienced deeper economic slowdown than some of the other former Soviet Republics. During the recession, Ukraine lost 60 percent of its GDP from 1991 to 1999, and suffered five-digit inflation rates. Dissatisfied with the economic conditions, as well as the amounts of crime and corruption in Ukraine, Ukrainians protested and organised strikes. The Ukrainian economy stabilized by the end of the 1990s. A new currency, the hryvnia, was introduced in 1996. Since 2000, the country has enjoyed steady real economic growth averaging about seven percent annually. A new Constitution of Ukraine was adopted under second President Leonid Kuchma in 1996, which turned Ukraine into a semi-presidential republic and established a stable political system. Kuchma was, however, criticized by opponents for corruption, electoral fraud, discouraging free speech and concentrating too much power in his office. He also repeatedly transferred public property into the hands of loyal oligarchs. Disputes with Russia over the price of natural gas briefly stopped all gas supplies to Ukraine in 2006 and again in 2009, leading to gas shortages in several other European countries. The Ukrainian landscape consists mostly of fertile plains (or steppes) and plateaus, crossed by rivers such as the Dnieper (Dnipro), Seversky Donets, Dniester and the Southern Buh as they flow south into the Black Sea and the smaller Sea of Azov. To the southwest, the delta of the Danube forms the border with Romania. Its various regions have diverse geographic features ranging from the highlands to the lowlands. The country's only mountains are the Carpathian Mountains in the west, of which the highest is the Hora Hoverla at 2,061 metres (6,762 ft), and the Crimean Mountains on the Crimean peninsula, in the extreme south along the coast. However Ukraine also has a number of highland regions such as the Volyn-Podillia Upland (in the west) and the Near-Dnipro Upland (on the right bank of Dnieper); to the east there are the south-western spurs of the Central Russian Uplands over which runs the border with Russia. Near the Sea of Azov can be found the Donets Ridge and the Near Azov Upland. The snow melt from the mountains feeds the rivers, and natural changes in altitude form a sudden drop in elevation and create many opportunities to form waterfalls. There are not only clear regional differences on questions of identity but historical cleavages remain evident at the level of individual social identification. Attitudes toward the most important political issue, relations with Russia, differed strongly between Lviv, identifying more with Ukrainian nationalism and the Ukrainian Greek Catholic Church, and Donetsk, predominantly Russian orientated and favorable to the Soviet era, while in central and southern Ukraine, as well as Kiev, such divisions were less important and there was less antipathy toward people from other regions (a poll by the Research & Branding Group held March 2010 showed that the attitude of the citizens of Donetsk to the citizens of Lviv was 79% positive and that the attitude of the citizens of Lviv to the citizens of Donetsk was 88% positive). However, all were united by an overarching Ukrainian identity based on shared economic difficulties, showing that other attitudes are determined more by culture and politics than by demographic differences. Surveys of regional identities in Ukraine have shown that the feeling of belonging to a "Soviet identity" is strongest in the Donbas (about 40%) and the Crimea (about 30%). More than 6600 species of fungi (including lichen-forming species) have been recorded from Ukraine., but this number is far from complete. The true total number of fungal species occurring in Ukraine, including species not yet recorded, is likely to be far higher, given the generally accepted estimate that only about 7% of all fungi worldwide have so far been discovered. Although the amount of available information is still very small, a first effort has been made to estimate the number of fungal species endemic to Ukraine, and 2217 such species have been tentatively identified. Ukraine has a mostly temperate continental climate, although the southern Crimean coast has a humid subtropical climate. Precipitation is disproportionately distributed; it is highest in the west and north and lowest in the east and southeast. Western Ukraine receives around 1,200 millimetres (47.2 in) of precipitation annually, while Crimea receives around 400 millimetres (15.7 in). Winters vary from cool along the Black Sea to cold farther inland. Average annual temperatures range from 5.5 °C (41.9 °F)–7 °C (44.6 °F) in the north, to 11 °C (51.8 °F)–13 °C (55.4 °F) in the south. With the proclamation of its independence on August 24, 1991, and adoption of a constitution on June 28, 1996, Ukraine became a semi-presidential republic. However, in 2004, deputies introduced changes to the Constitution, which tipped the balance of power in favour parliament. From 2004 to 2010, the legitimacy of the 2004 Constitutional amendments had official sanction, both with the Constitutional Court of Ukraine, and most major political parties. Despite this, on September 30, 2010 the Constitutional Court ruled that the amendments were null and void, forcing a return to the terms of the 1996 Constitution and again making Ukraine's political system more presidential in character. The ruling on the 2004 Constitutional amendments has become a major topic of political discourse. Much of the concern has been due to the fact that neither the Constitution of 1996 nor the Constitution of 2004 provides the ability to "undo the Constitution", as the decision of the Constitutional Court would have it, even though the 2004 constitution arguably has an exhaustive list of possible procedures for constitutional amendments (articles 154–159). In any case, the current Constitution can arguably be modified only by a vote in Parliament. The President is elected by popular vote for a five-year term and is the formal head of state. Ukraine's legislative branch includes the 450-seat unicameral parliament, the Verkhovna Rada. The parliament is primarily responsible for the formation of the executive branch and the Cabinet of Ministers, which is headed by the Prime Minister. However, the President still retains the authority to nominate the Ministers of the Foreign Affairs and of Defence for parliamentary approval, as well as the power to appoint the Prosecutor General and the head of the Security Service. Laws, acts of the parliament and the cabinet, presidential decrees, and acts of the Crimean parliament may be abrogated by the Constitutional Court, should they be found to violate the constitution. Other normative acts are subject to judicial review. The Supreme Court is the main body in the system of courts of general jurisdiction. Local self-government is officially guaranteed. Local councils and city mayors are popularly elected and exercise control over local budgets. The heads of regional and district administrations are appointed by the President in accordance with the proposals of the Prime-Minister. This system virtually requires an agreement between the President and the Prime-Minister, and has in the past led to problems, such as when President Yushchenko used a legally controversial ways to evade the law by appointing no actual governors or the local leaders, but so called 'temporarily acting' officers, thus evading the need to seek a compromise with the Prime-Minister. This practice was very controversial and required review by the Constitutional Court. The courts enjoy legal, financial and constitutional freedom guaranteed by measures adopted in Ukrainian law in 2002. Judges are largely well protected from dismissal (except in the instance of gross misconduct). Court justices are appointed by presidential decree for an initial period of five years, after which Ukraine's Supreme Council confirms their positions for life in an attempt to insulate them from politics. Although there are still problems with the performance of the system, it is considered to have been much improved since Ukraine's independence in 1991. The Supreme Court is regarded as being an independent and impartial body, and has on several occasions ruled against the Ukrainian government. Prosecutors in Ukraine have greater powers than in most European countries, and according to the European Commission for Democracy through Law ‘the role and functions of the Prosecutor’s Office is not in accordance with Council of Europe standards". In addition to this, from 2005 until 2008 the criminal judicial system maintained a 99.5 percent conviction rate, equal to the conviction rate of the Soviet Union, with suspects often being incarcerated for long periods before trial. On March 24, 2010, President Yanukovych formed an expert group to make recommendations how to "clean up the current mess and adopt a law on court organization". One day after setting this commission Yanukovych stated "We can no longer disgrace our country with such a court system." Judicial and penal institutions play a fundamental role in protecting citizens and safeguarding the common good. The criminal judicial system and the prison system of Ukraine remain quite punitive. In contemporary Ukraine prison ministry of chaplains does not exist de jure. Since January 1, 2010 it is allowed to hold court proceedings in Russian on mutual consent of parties. Citizens who are unable to speak Ukrainian or Russian are allowed to use their native language or the services of a translator. Previously all court proceedings were required to be held in Ukrainian, which is the nation's only language with any truly official administrative status. Law enforcement agencies in Ukraine are typically organised under the authority of the Ministry of Internal Affairs. They consist primarily of the national police force (Мiлiцiя) and various specialised units and agencies such as the State Border Guard and the Coast Guard services. In recent years the law enforcement agencies, particularly the police, have faced criticism for their heavy handling of the 2004 Orange Revolution, this criticism stems from the use by the Kuchma government's contemplated use of Berkut special operations units and internal troops in a plan to put an end to demonstrations on Kiev's Maidan Nezalezhnosti. The actions of the government saw many thousands of police officers mobilised and stationed throughout the capital, primarily to dissuade protesters from challenging the state's authority but also to provide a quick reaction force in case of need; most officers were armed and another 10,000 were held in reserve nearby. Bloodshed was only avoided when Lt. Gen. Sergei Popkov heeded his colleagues' calls to withdraw. Ukraine currently considers Euro-Atlantic integration its primary foreign policy objective, but in practice balances its relationship with the European Union and the United States with strong ties to Russia. The European Union's Partnership and Cooperation Agreement (PCA) with Ukraine went into force on March 1, 1998. The European Union (EU) has encouraged Ukraine to implement the PCA fully before discussions begin on an association agreement. The EU Common Strategy toward Ukraine, issued at the EU Summit in December 1999 in Helsinki, recognizes Ukraine's long-term aspirations but does not discuss association. On January 31, 1992, Ukraine joined the then-Conference on Security and Cooperation in Europe (now the Organization for Security and Cooperation in Europe—OSCE), and on March 10, 1992, it became a member of the North Atlantic Cooperation Council. Ukraine also has a close relationship with NATO and had previously declared interest in eventual membership, this however was removed from the government's foreign policy agenda, upon election of Viktor Yanukovych to the presidency, in 2010. It is the most active member of the Partnership for Peace (PfP). All major political parties in Ukraine support full eventual integration into the European Union. The Association Agreement with the EU was expected to be signed into effect by the end of 2011, but the process has been suspended as of 2012 due to recent political developments. Ukraine maintains peaceful and constructive relations with all its neighbours; it has especially close ties with Russia and Poland, although relations with the former are complicated by energy dependence and payment arrears. After the dissolution of the Soviet Union, Ukraine inherited a 780,000-man military force on its territory, equipped with the third-largest nuclear weapons arsenal in the world. In May 1992, Ukraine signed the Strategic Arms Reduction Treaty (START) in which the country agreed to give up all nuclear weapons to Russia for disposal and to join the Nuclear Non-Proliferation Treaty as a non-nuclear weapon state. Ukraine ratified the treaty in 1994, and by 1996 the country became free of nuclear weapons. Ukraine has been playing an increasingly larger role in peacekeeping operations. Ukrainian troops are deployed in Kosovo as part of the Ukrainian-Polish Battalion. A Ukrainian unit was deployed in Lebanon, as part of UN Interim Force enforcing the mandated ceasefire agreement. There was also a maintenance and training battalion deployed in Sierra Leone. In 2003–05, a Ukrainian unit was deployed as part of the Multinational force in Iraq under Polish command. The total Ukrainian military deployment around the world is 562 servicemen. Following independence, Ukraine declared itself a neutral state. The country has had a limited military partnership with Russia, other CIS countries and a partnership with NATO since 1994. In the 2000s, the government was leaning towards NATO, and a deeper cooperation with the alliance was set by the NATO-Ukraine Action Plan signed in 2002. It was later agreed that the question of joining NATO should be answered by a national referendum at some point in the future. Current President Viktor Yanukovych considers the current level of co-operation between Ukraine and NATO sufficient. Yanukovich is against Ukraine joining NATO. During the 2008 Bucharest summit NATO declared that Ukraine will become a member of NATO, whenever it wants and when it would correspond to the criteria for the accession. In the meantime, by 1999, the GDP had fallen to less than 40 percent of the 1991 level. It recovered considerably in the following years, but still doesn't reach historical maximum. In the early 2000s, the economy showed strong export-based growth of 5 to 10 percent, with industrial production growing more than 10 percent per year. Ukraine was hit by the economic crisis of 2008 and in November 2008, the IMF approved a stand-by loan of $16.5 billion for the country. Ukraine’s 2010 GDP (PPP), as calculated by the CIA, is ranked 38th in the world and estimated at $305.2 billion. Its GDP per capita in 2010 according to the CIA was $6,700 (in PPP terms), ranked 107th in the world. Nominal GDP (in U.S. dollars, calculated at market exchange rate) was $136 billion, ranked 53rd in the world. By July 2008 the average nominal salary in Ukraine reached 1,930 hryvnias per month. Despite remaining lower than in neighbouring central European countries, the salary income growth in 2008 stood at 36.8 percent According to the UNDP in 2003 4.9% of the Ukrainian population lived under 2 US dollar a day and 19.5% of the population lived below the national poverty line that same year. Ukraine has a very large heavy-industry base and is one of the largest refiners of metallurgical products in Eastern Europe. However, the country is also well known for its production of high-technological goods and transport products, such as Antonov aircraft and various private and commercial vehicles. The country’s largest and most competitive firms are components of the PFTS index which is traded on the PFTS Ukraine Stock Exchange. Well known Ukrainian brands include, amongst others, Naftogaz Ukrainy, AvtoZAZ, PrivatBank, Roshen, Yuzhmash, Nemiroff, Motor Sich, Khortytsa, Kyivstar, and Aerosvit. Ukraine is regarded as being a developing economy with high potential for future success, however such a development is thought to be likely only with new all-encompassing economic and legal reforms. Although Foreign Direct Investment in Ukraine has remained relatively strong ever since recession of the early 1990s, the country has had trouble maintaining stable economic growth. Issues relating to current corporate governance in Ukraine are primarily linked to the large scale monopolisation of traditional heavy industries by wealthy individuals such as Rinat Akhmetov, the enduring failure to broaden the nation’s economic base and a lack of effective legal protection for investors and their products. Despite all this, Ukraine’s economy is still expected to grow by around 3.5% in 2010. Most of the Ukrainian road system has not been upgraded since the Soviet era, and is now outdated. The Ukrainian government has pledged to build some 4,500 km (2,800 mi) of motorways by 2012. In total, Ukrainian paved roads stretch for 164,732 kilometres (102,360 mi). The network of major routes, marked with the letter ‘M’ for ‘International’ (Ukrainian: Міжнародний), extends nationwide and connects all the major cities of Ukraine as well as providing cross-border routes to the country’s neighbours. Currently there are only two true motorway standard highways in Ukraine; a 175 km stretch of motorway from Kharkiv to Dnipropetrovsk, and a section of the M03 which extends 18 km (11 mi) from Kiev to Boryspil, where the city’s international airport is located. Rail transport in Ukraine plays the role of connecting all major urban areas, port facilities and industrial centres with neighbouring countries. The heaviest concentration of railroad track is located in the Donbas region of Ukraine. Although the amount of freight transported by rail fell by 7.4 percent in 1995 in comparison with 1994, Ukraine is still one of the world’s highest rail users. The total amount of railroad track in Ukraine extends for 22,473 kilometres (13,964 mi), of which 9,250 kilometres (5,750 mi) is electrified. Currently the state has a monopoly on the provision of passenger rail transport, and all trains, other than those with cooperation of other foreign companies on international routes, are operated by its company ‘Ukrzaliznytsia’. The aviation section in Ukraine is developing very quickly, having recently established a visa-free program for EU nationals and citizens of a number of other Western nations, the nation’s aviation sector is handling a significantly increased number of travellers. Additionally, the granting of the Euro 2012 football tournament to Poland and Ukraine as joint hosts has prompted the government to invest huge amounts of money into transport infrastructure, and in particular airports. Kiev Boryspil is the county's largest international airport; it has a total of three main passenger terminals and is the base for both of Ukraine's national airlines. Other large airports in the country include those in Kharkiv, Lviv and Donetsk - all of which have recently-constructed, modern terminals and aviation facilities, whilst those in Dnipropetrovsk and Odessa have plans for terminal upgrades in the near future. Ukraine has a number of airlines, the largest of which are the nation’s flag carriers, Aerosvit and UIA. Antonov Airlines, a subsidiary of the Antonov Aerospace Design Bureau is the only operator of the world’s largest fixed wing aircraft, the An-225. Ukraine is one of Europe’s largest energy consumers; it consumes almost double the energy of Germany, per unit of GDP. A great share of energy supply in Ukraine comes from nuclear power, with the country receiving most of its nuclear fuel from Russia. The remaining oil and gas is also imported from the former Soviet Union. Ukraine is heavily dependent on its nuclear power. The largest nuclear power plant in Europe, the Zaporizhzhia Nuclear Power Plant, is located in Ukraine. In 2006, the government planned to build 11 new reactors by the year 2030, in effect, almost doubling the current amount of nuclear power capacity. Ukraine’s power sector is the twelfth-largest in the world in terms of installed capacity, with 54 gigawatts (GW). In 2007 47.4% of power came from coal and gas (approx 20% gas), 47.5% from nuclear (92.5 TWh) and 5% from hydro. Currently the country has four active nuclear power stations, located in Kuznetsovsk, Enerhodar, Yuzhnoukrainsk and Netishyn. In addition to these active plants, a fifth reactor complex had been planned for the Crimea, but construction was suspended indefinitely in the wake of the Chernobyl disaster, a major nuclear incident which took place at the Chernobyl Atomic Energy Station, 110 km (68 mi) north of Kiev. All of Ukraine’s RBMK reactors (the type involved in the Chernobyl disaster), were located at the Chernobyl Nuclear Power Plant. All of the reactors there have been shut down leaving only VVER reactors operating in the country, which are much safer than RBMK units. Three of these new-type reactors were built since 1991 in the independent Ukraine (with the first one in 1995), whilst the other sixteen were inherited from the Soviet Union. The share of renewables within the total energy mix is still very small, but is growing fast. Total installed capacity of renewable energy installations more than doubled in 2011 and now stands at 397 MW. Indeed, 2011 was a breakthrough year for renewable energy development in Ukraine, especially for solar energy. First, Okhotnykovo Solar Park, one of the world’s largest, was put into operation in July. Then, six months later, Europe’s largest solar park was completed in Perovo, (Crimea). Ukrainian State Agency for Energy Efficiency and Conservation forecasts that combined installed capacity of wind and solar power plants in Ukraine could increase by another 600 MW in 2012. According to Macquarie Research, by 2016 Ukraine will construct and commission new PV facilities with a total capacity of 1.8 GW, which is almost equivalent to the capacity of two nuclear reactors. The Economic Bank for Reconstruction and Development estimates that Ukraine has great renewable energy potential: the technical potential for wind energy is estimated at 40 TWh/year, small hydro at 8.3 TWh/year, biomass at 120 TWh/year, and solar energy at 50 TWh/year. In March 2011, Mykyta Konstantinov, director of the strategic policy, investment and nuclear energy complex department at the Ministry of Energy and Coal Mining Industry of Ukraine, said that the installed capacity of alternative and renewable energy sources will increase to 9% (about 6 GW) of the total electricity production in the country. Ukraine has a large and steadily growing Internet sector, mostly uninfluenced by the global financial crisis; rapid growth is forecast for at least two more years. Ukraine is ranked 9th in the "Top 10 Internet countries in Europe" (as of 2011) with 33.9%	Internet penetration and 15.3 million users. Ukraine has been in a demographic crisis since the 1980s because of its high death rate and a low birth rate. The population is shrinking by over 150,000 a year. The birth rate has recovered in recent years from a catastrophically low level around 2000, and is now comparable to the European average, but would need to increase by another 50% or so to stabilize the population. Life expectancy is falling. The nation suffers a high mortality rate from environmental pollution, poor diets, widespread smoking, extensive alcoholism, and deteriorating medical care. In the years 2008 through 2010, more than 1.5 million children were born in Ukraine, compared to fewer than 1.2 million during 1999–2001 during the worst of the demographic crisis. Infant mortality rates have also dropped from 10.4 deaths to 8.9 per 1,000 children under one year of age. This is still high in comparison, however, to many other nations. According to the United Nations, poverty and poor health care are the two biggest problems Ukrainian children face. More than 26 percent of families with one child, 42 percent of families with two children and 77 percent of families with four and more children live in poverty, according to United Nations International Children's Emergency Fund. In November 2009 Ukrainian human rights ombudsman Nina Karpacheva stated that the lives of many of Ukraine’s 8.2 million children remain tough. To help mitigate the declining population, the government continues to increase child support payments. Thus it provides one-time payments of 12,250 Hryvnias for the first child, 25,000 Hryvnias for the second and 50,000 Hryvnias for the third and fourth, along with monthly payments of 154 Hryvnias per child. The demographic trend is showing signs of improvement, as the birth rate has been steadily growing since 2001. Net population growth over the first nine months of 2007 was registered in five provinces of the country (out of 24), and population shrinkage was showing signs of stabilising nationwide. In 2007 the highest birth rates were in the Western Oblasts. In 2008, Ukraine emerged from lowest-low fertility, and the upward trend has continued since then, except for a slight dip in 2010 due to the economic crisis of 2009 (see demographic tables). According to the constitution, the state language of Ukraine is Ukrainian. Russian, which was the de facto official language of the Soviet Union, is widely spoken, especially in eastern and southern Ukraine. According to the 2001 census, 67.5 percent of the population declared Ukrainian as their native language and 29.6 percent declared Russian. Most native Ukrainian speakers know Russian as a second language. On July 3, 2012, the Ukrainian Parliament approved a bill that Russian and other languages spoken by at least 10 percent of their residents as official languages, although Ukrainian language is still State Language for all. These details result in a significant difference across different survey results, as even a small restating of a question switches responses of a significant group of people. [f] Ukrainian is mainly spoken in western and central Ukraine. In western Ukraine, Ukrainian is also the dominant language in cities (such as Lviv). In central Ukraine, Ukrainian and Russian are both equally used in cities, with Russian being more common in Kiev,[f] while Ukrainian is the dominant language in rural communities. In eastern and southern Ukraine, Russian is primarily used in cities, and Ukrainian is used in rural areas. For a large part of the Soviet era, the number of Ukrainian speakers declined from generation to generation, and by the mid-1980s, the usage of the Ukrainian language in public life had decreased significantly. Following independence, the government of Ukraine began restoring the image and usage of Ukrainian language through a policy of Ukrainisation. Today, all foreign films and TV programs, including Russian ones, are subbed or dubbed in Ukrainian. The dominant religion in Ukraine is Orthodox Christianity, which is currently split between three Church bodies: the Ukrainian Orthodox Church autonomous church body under the Patriarch of Moscow, the Ukrainian Orthodox Church – Kiev Patriarchate, and the Ukrainian Autocephalous Orthodox Church. Protestant Christians also form around 2.19 percent of the population. Protestant numbers have grown greatly since Ukrainian independence. The Evangelical Baptist Union of Ukraine is the largest group, with more than 150,000 members and about 3000 clergy. The second largest Protestant church is the Ukrainian Church of Evangelical faith (Pentecostals) with 110000 members and over 1500 local churches and over 2000 clergy, but there also exist other Pentecostal groups and unions and together all Pentecostals are over 300,000, with over 3000 local churches. Also there are many Pentecostal high education schools such as the Lviv Theological Seminary and the Kiev Bible Institute. Other groups include Calvinists, Jehovah's Witnesses, Lutherans, Methodists and Seventh-day Adventists. The Church of Jesus Christ of Latter-day Saints (Mormon) is also present. Significant migration took place in the first years of Ukrainian independence. More than one million people moved into Ukraine in 1991–2, mostly from the other former Soviet republics. In total, between 1991 and 2004, 2.2 million immigrated to Ukraine (among them, 2 million came from the other former Soviet Union states), and 2.5 million emigrated from Ukraine (among them, 1.9 million moved to other former Soviet Union republics). Currently, immigrants constitute an estimated 14.7% of the total population, or 6.9 million people; this is the fourth largest figure in the world. In 2006, there were an estimated 1.2 million Canadians of Ukrainian ancestry, giving Canada the world's third-largest Ukrainian population behind Ukraine itself and Russia. All the country's medical service providers and hospitals are subordinate to the Ministry of Health, which provides oversight and scrutiny of general medical practice as well as being responsible for the day to day administration of the healthcare system. Despite this standards of hygiene and patient-care have fallen. Hospitals in Ukraine are organised along the same lines as most European nations, according to the regional administrative structure; resultantly most towns have their own hospital (Міська Лікарня) and many also have district hospitals (Районна Лікарня). Larger and more specialised medical complexes tend only to be found in major cities, with some even more specialised units located only in the capital, Kiev. However, all Oblasts have their own network of general hospitals which are able to deal with almost all medical problems and are typically equipped with major trauma centres; such hospitals are called 'regional hospitals' (Обласна Лікарня). Ukraine currently faces a number of major public health issues, and is considered to be in a demographic crisis due to its high death rate and low birth rate (the current Ukrainian birth rate is 11 births/1,000 population, and the death rate is 16.3 deaths/1,000 population). A factor contributing to the relatively high death is a high mortality rate among working-age males from preventable causes such as alcohol poisoning and smoking. In 2008, the country's population was one of the fastest declining in the world at −5% growth. The UN warned that Ukraine's population could fall by as much as 10 million by 2050 if trends did not improve. In addition to this obesity, systemic high blood pressure and the HIV endemic are all major challenges facing the contemporary Ukrainian healthcare system. As of March 2009 the Ukrainian government to reforming the health care system, by the creation of a national network of family doctors and improvements in the medical emergency services. former Prime Minister Yulia Tymoshenko put forward (in November 2009) an idea to start introducing a public healthcare system based on health insurance in the spring of 2010. The history of Ukrainian literature dates back to the 11th century, following the Christianisation of the Kievan Rus’. The writings of the time were mainly liturgical and were written in Old Church Slavonic. Historical accounts of the time were referred to as chronicles, the most significant of which was the Primary Chronicle. [g] Literary activity faced a sudden decline during the Mongol invasion of Rus'. The 19th century initiated a vernacular period in Ukraine, led by Ivan Kotliarevsky’s work Eneyida, the first publication written in modern Ukrainian. By the 1830s, Ukrainian romanticism began to develop, and the nation’s most renowned cultural figure, romanticist poet-painter Taras Shevchenko emerged. Where Ivan Kotliarevsky is considered to be the father of literature in the Ukrainian vernacular; Shevchenko is the father of a national revival. Then, in 1863, use of the Ukrainian language in print was effectively prohibited by the Russian Empire. This severely curtained literary activity in the area, and Ukrainian writers were forced to either publish their works in Russian or release them in Austrian controlled Galicia. The ban was never officially lifted, but it became obsolete after the revolution and the Bolsheviks’ coming to power. Ukrainian literature continued to flourish in the early Soviet years, when nearly all literary trends were approved. These policies faced a steep decline in the 1930s, when Stalin implemented his policy of socialist realism. The doctrine did not necessarily repress the Ukrainian language, but it required writers to follow a certain style in their works. Literary activities continued to be somewhat limited under the communist party, and it was not until Ukraine gained its independence in 1991 when writers were free to express themselves as they wished. Several examples of these churches survive to this day; however, during the 16th, 17th, and 18th centuries, many were externally rebuilt in the Ukrainian Baroque style (see below). Examples include the grand St. Sophia of Kiev – the year 1017 is the earliest record of foundation laid, Church of the Saviour at Berestove – built from 1113 to 1125, and St. Cyril's Church, circa 12th century. All can still be found in the Ukrainian capital. Several buildings were reconstructed during the late-19th century, including the Assumption Cathedral in Volodymyr-Volynskyi, built in 1160 and reconstructed in 1896–1900, the Paraskevi church in Chernihiv, built in 1201 with reconstruction done in the late 1940s, and the Golden gates in Kiev, built in 1037 and reconstructed in 1982. The latter's reconstruction was criticized by some art and architecture historians as a revivalist fantasy. Unfortunately little secular or vernacular architecture of Kievan Rus' has survived. As Ukraine became increasingly integrated into the Russian Empire, Russian architects had the opportunity to realize their projects in the picturesque landscape that many Ukrainian cities and regions offered. St. Andrew's Church of Kiev (1747–1754), built by Bartolomeo Rastrelli, is a notable example of Baroque architecture, and its location on top of the Kievan mountain made it a recognizable monument of the city. An equally notable contribution of Rasetrelli was the Mariyinsky Palace, which was built to be a summer residence to Russian Empress Elizabeth. During the reign of the last Hetman of Ukraine, Kirill Razumovsky, many of the Cossack Hetmanate's towns such as Hlukhiv, Baturyn and Koselets had grandiose projects built by the appointed architect of Little Russia, Andrey Kvasov. Russia, winning successive wars over the Ottoman Empire and its vassal Crimean Khanate, eventually annexed the whole south of Ukraine and Crimea. Renamed New Russia, these lands were to be colonized, and new cities such as the Nikolayev, Odessa, Kherson and Sevastopol were founded. These would contain notable examples of Imperial Russian architecture. In 1934, the capital of Soviet Ukraine moved from Kharkiv to Kiev. During the preceding years, the city was seen as only a regional centre, and hence received little attention. All of that was to change, but at a great price. By this point, the first examples of Stalinist architecture were already showing, and, in light of the official policy, a new city was to be built on top of the old one. This meant that much-admired examples such as the St. Michael's Golden-Domed Monastery were destroyed. Even the St. Sophia Cathedral was under threat. Also, the Second World War contributed to the wreckage. After the war, a new project for the reconstruction of central Kiev was unveiled. This transformed the Khreshchatyk avenue into one of the most notable examples of Stalinism in Architecture. However, by 1955, the new politics of architecture once again promptly stopped the project from fully being realised. Music is a major part of Ukrainian culture, with a long history and many influences. From traditional folk music, to classical and modern rock, Ukraine has produced a long list of internationally recognized musical talent including Tchaikovsky, Okean Elzy and Ruslana. Elements from traditional Ukrainian folk music made their way into Western music and even into modern jazz. In the course of the 18th century in the Russian Empire court musicians were typically trained at the music academy in Hlukhiv, and largely came from Ukraine. Notable performers of the era include Tymofiy Bilohradsky who later studied lute under Sylvius Leopold Weiss in Dresden, his daughter Yelyzaveta who was a famous operatic soprano, and Oleksiy Rozumovsky, a court bandurist and the morganatic husband of Empress Elizabeth. The first dedicated musical academy was set up in Hlukhiv, Ukraine in 1738 and students were taught to sing, play violin and bandura from manuscripts. As a result many of the earliest composers and performers within the Russian empire were ethnically Ukrainian, having been born or educated in Hlukhiv, or had been closely associated with this music school. See: Dmytro Bortniansky, Maksym Berezovsky, Artemiy Vedel. The first category is closely tied with the Ukrainian national school of music spearheaded by Mykola Lysenko. It includes such composers as Kyrylo Stetsenko, Mykola Leontovych, Levko Revutsky, Borys Lyatoshynsky, Mykola Vilinsky. Most of their music contains Ukrainian folk figures and are composed to Ukrainian texts. On the other hand, the second category is of particular importance and international visibility, because of the large percentage of ethnic minorities in urban Ukraine. This category includes such composers as Franz Xavier Mozart, Isaak Dunayevsky, Rheinhold Gliere, Yuliy Meitus and Sergei Prokofiev, performers Volodymyr Horovyts, David Oistrakh, Sviatoslav Richter and Isaac Stern. The music of these composers rarely contains Ukrainian folk motives and more often is written to the texts of Russian or Polish poets. Whilst the third category includes a number of prominent individuals who are often not part of the mainstream Ukrainian culture but who have made a significant impact on music in Ukraine, while living outside of its borders. These include historic individuals such as: Bortniansky, Berezovsky, Vedel, Tuptalo and Titov. It also contains "Soviet" composers such as Mykola Roslavets, Isaak Dunayevsky who were born in Ukraine but who moved to other cultural centres within the Soviet Union. In North America we have Mykola Fomenko, Yuriy Oliynyk, Zinoviy Lavryshyn and Wasyl Sydorenko. Since the mid-1960s, Western-influenced pop music, in its various forms, that has been growing in popularity in Ukraine. One of the most important and truly original musicians to come out of Ukraine in recent years is the ultra avant-garde folk singer and harmonium player Mariana Sadovska. Ukrainian pop and folk music arose with the international popularity of groups like Vopli Vidoplyasova, Viy, and Okean Elzy. 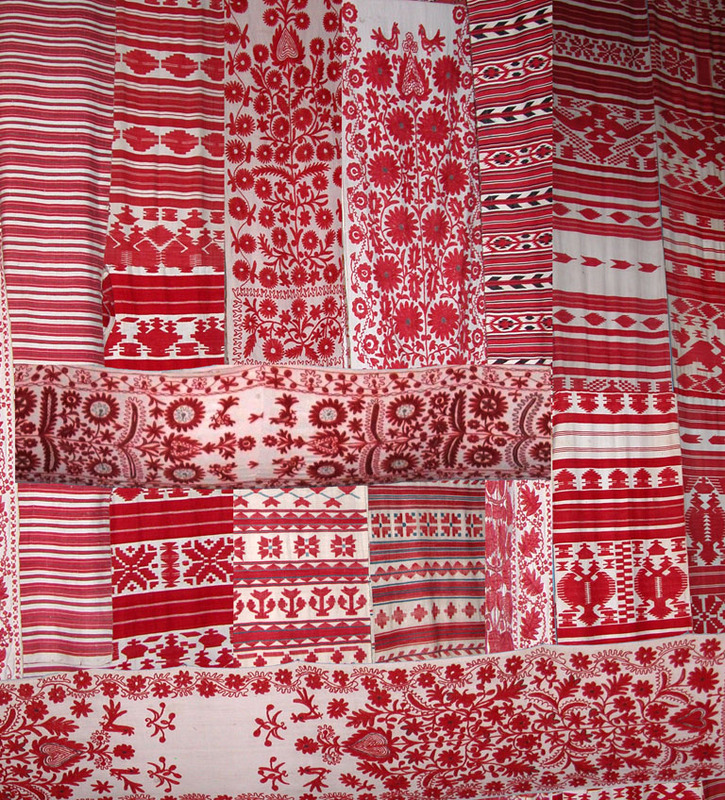 Artisan textile arts play an important role in Ukrainian culture, especially in Ukrainian wedding traditions. Ukrainian embroidery, weaving and lace-making are used in traditional folk dress and in traditional celebrations. Ukrainian embroidery varies depending on the region of origin and the designs have a long history of motifs, compositions, choice of colors and types of stitches. Use of color is very important and has roots in Ukrainian folklore. Embroidery motifs found in different parts of Ukraine are preserved in the Rushnyk Museum in Pereiaslav-Khmelnytskyi. National dress is woven and highly decorated. Weaving with handmade looms is still practised in the village of Krupove, situated in Rivne Oblast. The village is the birthplace of two famous personalities in the scene of national crafts fabrication. Nina Myhailivna and Uliana Petrivna with international recognition. In order to preserve this traditional knowledge the village is planning to open a local weaving center, a museum and weaving school. Ukraine greatly benefited from the Soviet emphasis on physical education. Such policies left Ukraine with hundreds of stadia, swimming pools, gymnasia, and many other athletic facilities. The most popular sport is football. The top professional league is the Vyscha Liha ("premier league"). The two most successful teams in the Vyscha Liha are rivals FC Dynamo Kyiv and FC Shakhtar Donetsk. Although Shakhtar is the reigning champion of the Vyscha Liha, Dynamo Kyiv has been much more successful historically, winning two UEFA Cup Winners' Cups, one UEFA Super Cup, a record 13 USSR Championships and a record 12 Ukrainian Championships; while Shakhtar only won six Ukrainian championships and one and last UEFA Cup. Ukraine co-hosted UEFA Euro 2012 alongside Poland. Sergey Bubka holds the record in the Pole vault; with a great strength, speed and gymnastic abilities, he is repeatedly voted the world's best athlete. Many Ukrainians also played for the Soviet national football team, most notably Ihor Belanov and Oleh Blokhin, winners of the prestigious Golden Ball Award for the best football player of the year. This award was only presented to one Ukrainian after the dissolution of the Soviet Union, Andriy Shevchenko, the current captain of the Ukrainian national football team. The national team made its debut in the 2006 FIFA World Cup, and reached the quarterfinals before losing to eventual champions, Italy. Ukrainians also fared well in boxing, where the brothers Vitali and Wladimir Klitschko have held world heavyweight championships. Ukraine made its Olympic debut at the 1994 Winter Olympics. So far, Ukraine has been much more successful in Summer Olympics (96 medals in four appearances) than in the Winter Olympics (five medals in four appearances). Ukraine is currently ranked 35th by number of gold medals won in the All-time Olympic Games medal count, with every country above it, except for Russia, having more appearances. a. ^ Among the Ukrainians that rose to the highest offices in the Russian Empire were Aleksey Razumovsky, Alexander Bezborodko, Ivan Paskevich. Among the Ukrainians who greatly influenced the Russian Orthodox Church in this period were Stephen Yavorsky, Feofan Prokopovich, Dimitry of Rostov. c. 1 2 Estimates on the number of deaths vary. Official Soviet data is not available because the Soviet government denied the existence of the famine. See the Holodomor article for details. Sources differ on interpreting various statements from different branches of different governments as to whether they amount to the official recognition of the Famine as Genocide by the country. For example, after the statement issued by the Latvian Sejm on March 13, 2008, the total number of countries is given as 19 (according to Ukrainian BBC: "Латвія визнала Голодомор ґеноцидом"), 16 (according to Korrespondent, Russian edition: "После продолжительных дебатов Сейм Латвии признал Голодомор геноцидом украинцев"), "more than 10" (according to Korrespondent, Ukrainian edition: "Латвія визнала Голодомор 1932–33 рр. геноцидом українців") Retrieved on 2008-01-27. "What language is spoken in Ukraine?". Welcome to Ukraine. 2003/2. http://www.wumag.kiev.ua/index2.php?param=pgs20032/72. Retrieved July 11, 2008. ^ "Law of Ukraine. State Anthem of Ukraine" (in Ukrainian). Verkhovna Rada of Ukraine. March 6, 2003. http://zakon.rada.gov.ua/cgi-bin/laws/main.cgi?nreg=602-15. ^ "Law of Ukraine "On Principles of State Language Policy"". Zakon2.rada.gov.ua. http://zakon2.rada.gov.ua/laws/show/5029-17. Retrieved 2012-08-25. ^ a b c "Population by ethnic nationality, 1 January, year". ukrcensus.gov.ua. Ukrainian Office of Statistics. Archived from the original on March 23, 2008. http://web.archive.org/web/20080323110131/http://www.ukrcensus.gov.ua/eng/results/general/nationality/. Retrieved April 17, 2010. ^ "People and Society: Ukraine". CIA World Factbook. https://www.cia.gov/library/publications/the-world-factbook/geos/up.html. Retrieved April 22, 2012. ^ a b c d "Report for Selected Countries and Subjects". World Economic Outlook Database. International Monetary Fund. October 2012. http://www.imf.org/external/pubs/ft/weo/2012/02/weodata/weorept.aspx?sy=2010&ey=2017&scsm=1&ssd=1&sort=country&ds=.&br=1&c=926&s=NGDPD%2CNGDPDPC%2CPPPGDP%2CPPPPC&grp=0&a=&pr.x=10&pr.y=11. Retrieved January 18, 2013. ^ "HDRO (Human Development Report Office) United Nations Development Programme". United Nations. 2011. http://hdr.undp.org/en/media/HDR_2011_EN_Tables.pdf. Retrieved November 2, 2011. ^ "Рішення Ради: Україна 30 жовтня перейде на зимовий час » Події » Україна » Кореспондент". Ua.korrespondent.net. http://ua.korrespondent.net/ukraine/events/1273613-rishennya-radi-ukrayina-30-zhovtnya-perejde-na-zimovij-chas. Retrieved October 31, 2011. ^ "Basic facts about Ukraine". Ukrainian consul in NY. http://www.ukrconsul.org/BASIC_FACTS.htm. Retrieved November 10, 2010. 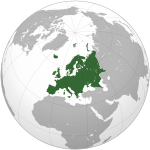 ^ "Ukraine :: History – Britannica Online Encyclopedia". Britannica.com. http://www.britannica.com/EBchecked/topic/612921/Ukraine/214508/History. Retrieved October 31, 2011. ^ a b "Activities of the Member States – Ukraine". United Nations. http://www.un.org/depts/dhl/unms/ukraine.shtml. Retrieved January 17, 2011. ^ a b "Macroeconomic Indicators". National Bank of Ukraine. Archived from the original on October 21, 2007. http://web.archive.org/web/20071021232506/http://bank.gov.ua/Engl/Macro/index.htm. Retrieved December 16, 2007. ^ "Ukraine becomes world's third biggest grain exporter in 2011 – minister". Blackseagrain.net. http://www.blackseagrain.net/photo/ukraine-becomes-worlds-third-biggest-grain-exporter-in-2011-minister. Retrieved 2012-08-25. ^ Русанівський, В. М. Українська мова // Енциклопедія «Українська мова». — К., 2000. ^ "З Енциклопедії Українознавства; Назва "Україна"". Litopys.org.ua. http://litopys.org.ua/rizne/nazva_eu.htm. Retrieved October 31, 2011. ^ a b "Григорій Півторак. Походження українців, росіян, білорусів та їхніх мов". Litopys.org.ua. http://litopys.org.ua/pivtorak/pivt12.htm. Retrieved October 31, 2011. ^ The Comprehensive Dictionary of the Contemporary Ukrainian Language, Perun Publishers, 2005. ^ The Comprehensive Dictionary of the Contemporary Russian Language, 2006, T.F. Yefremova. ^ a b "Ukraine – Definition and More from the Free Merriam-Webster Dictionary". Merriam-Webster Online Dictionary. http://www.merriam-webster.com/dictionary/ukraine. Retrieved May 4, 2012. ^ a b "The Ukraine". Wsu.edu. http://www.wsu.edu/~brians/errors/ukraine.html. Retrieved December 30, 2010. ^ "Country Names and "the"". Grammar Girl. http://grammar.quickanddirtytips.com/country-name-article-the-ukraine.aspx. Retrieved May 30, 2012. ^ "Горячая десятка вопросов". ГРАМОТА.РУ. http://www.gramota.ru/spravka/buro/hot10/. Retrieved January 30, 2013. ^ Carpenter, Jennifer (June 20, 2011). "Early human fossils unearthed in Ukraine". BBC. http://www.bbc.co.uk/news/science-environment-13846262. Retrieved June 21, 2011. ^ "Scythian". Encyclopædia Britannica (fee required). Archived from the original on September 30, 2007. http://web.archive.org/web/20070930012558/http://www.britannica.com/eb/article-9066426. Retrieved September 12, 2007. ^ a b c d e f g h i j "Ukraine". CIA World Factbook. December 13, 2007. https://www.cia.gov/library/publications/the-world-factbook/geos/up.html. Retrieved December 24, 2007. ^ a b c "Kievan Rus". The Columbia Encyclopedia. 2001–2005. http://www.bartleby.com/65/ki/KievanRu.html. Retrieved on 2008-01-27. ^ "The Destruction of Kiev". University of Toronto's Research Repository. https://tspace.library.utoronto.ca/citd/RussianHeritage/4.PEAS/4.L/12.III.5.html. Retrieved January 3, 2008. ^ "Poland". Encyclopædia Britannica (fee required). Archived from the original on October 11, 2007. http://web.archive.org/web/20071011213405/http://britannica.com/eb/article-28237. Retrieved September 12, 2007. ^ a b Krupnytsky B. and Zhukovsky A.. "Zaporizhia, The". Encyclopedia of Ukraine. http://www.encyclopediaofukraine.com/display.asp?linkPath=pages\Z\A\ZaporizhiaThe.htm. Retrieved December 16, 2007. ^ a b "Ukraine – The Cossacks". Encyclopædia Britannica (fee required). Archived from the original on October 11, 2007. http://web.archive.org/web/20071011213409/http://britannica.com/eb/article-30078/Ukraine. Retrieved September 12, 2007. ^ Halil Inalcik. "Servile Labor in the Ottoman Empire" in A. Ascher, B. K. Kiraly, and T. Halasi-Kun (eds), The Mutual Effects of the Islamic and Judeo-Christian Worlds: The East European Pattern, Brooklyn College, 1979, pp. 25–43. ^ a b Remy, Johannes (March–June 2007). "Valuev Circular and Censorship of Ukrainian Publications in the Russian Empire (1863–1876)". Canadian Slavonic Papers (findarticles.com). http://findarticles.com/p/articles/mi_qa3763/is_200703/ai_n19433957. Retrieved December 16, 2007. ^ Subtelny, Orest (2000). Ukraine: A History. University of Toronto Press. pp. 340–344. ISBN 0-8020-8390-0. ^ Horbal, Bogdan. "Talerhof". The world academy of Rusyn culture. http://www.rusyn.org/histalerhof.html. Retrieved January 20, 2008. ^ Cipko, Serge. "Makhno, Nestor". Encyclopedia of Ukraine. http://www.encyclopediaofukraine.com/display.asp?linkPath=pages\M\A\MakhnoNestor.htm. Retrieved January 17, 2008. ^ a b c d e f "Interwar Soviet Ukraine". Encyclopædia Britannica (fee required). http://www.britannica.com/eb/article-30078/Ukraine. Retrieved September 12, 2007. ^ "Communism". Communism. http://encarta.msn.com/encyclopedia_761572241_2/communism.html. Retrieved July 5, 2008. ^ Stephen G. Wheatcroft, "Agency and Terror: Evdokimov and Mass Killing in Stalin's Great Terror." Australian Journal of Politics and History 2007 53(1): 20–43. Issn: 0004-9522 Fulltext in Ebsco; Robert Conquest, The Harvest of Sorrow: Soviet collectivization and the terror-famine (1986). Mark B. Tauger, "The 1932 Harvest and the Famine of 1933" Slavic Review, Vol. 50, No. 1 (Spring, 1991), pp. 70–89, notes the harvest was unusually poor. online in JSTOR; R. W. Davies, M. B. Tauger, S. G. Wheatcroft, "Stalin, Grain Stocks and the Famine of 1932–1933," Slavic Review, Vol. 54, No. 3 (Autumn, 1995), pp. 642–657 ; online in JSTOR]; Michael Ellman. "Stalin and the Soviet famine of 1932–33 Revisited," Europe-Asia Studies, Volume 59, Issue June 4, 2007, pages 663–93. ^ a b "World wars". Encyclopedia of Ukraine. http://www.encyclopediaofukraine.com/display.asp?linkpath=pages\W\O\Worldwars.htm. Retrieved December 20, 2007. ^ "Losses of the Ukrainian Nation, p. 2" (in Ukrainian). Peremoga.gov.ua. Archived from the original on May 15, 2005. http://web.archive.org/web/20050515091804/http://www.peremoga.gov.ua/index.php?2150005000000000020. Retrieved December 16, 2007. ^ "Ukrainian Insurgent Army". Encyclopedia of Ukraine. http://www.encyclopediaofukraine.com/display.asp?linkPath=pages\U\K\UkrainianInsurgentArmy.htm. Retrieved December 20, 2007. ^ a b "Ukraine – World War II and its aftermath". Encyclopædia Britannica (fee required). http://www.britannica.com/eb/article-30082. Retrieved December 28, 2007. ^ Rozhnov, Konstantin, "Who won World War II? ", BBC. Citing Russian historian Valentin Falin. Retrieved on 2008-07-05. ^ "Losses of the Ukrainian Nation, p. 1" (in Ukrainian). Peremoga.gov.ua. Archived from the original on October 25, 2007. http://web.archive.org/web/20071025001902/http://www.peremoga.gov.ua/index.php?3450000000000000010. Retrieved December 16, 2007. ^ a b "Losses of the Ukrainian Nation, p. 7" (in Ukrainian). Peremoga.gov.ua. Archived from the original on May 15, 2005. http://web.archive.org/web/20050515100506/http://www.peremoga.gov.ua/index.php?2150005000000000070. Retrieved December 16, 2007. ^ "Holidays". Ministry of Foreign Affairs of Ukraine. http://www.mfa.gov.ua/mfa/en/publication/content/290.htm. Retrieved August 24, 2008. ^ "Ukraine :: World War II and its aftermath". Encyclopædia Britannica (fee required). Archived from the original on September 29, 2007. http://web.archive.org/web/20070929133150/http://www.britannica.com/eb/article-30082/Ukraine. Retrieved September 12, 2007. ^ Kulchytsky, Stanislav, "Demographic losses in Ukraine in the twentieth century," The Mirror of the Week, October 2–8, 2004. Available online in Russian, in Russian, and in Ukrainian. ^ "The Transfer of Crimea to Ukraine". International Committee for Crimea. July 2005. http://www.iccrimea.org/historical/crimeatransfer.html. Retrieved March 25, 2007. ^ "Ukraine – The last years of Stalin's rule". Encyclopædia Britannica (fee required). Archived from the original on 15 January 2008. http://web.archive.org/web/20080115052626/http://www.britannica.com/eb/article-30084/Ukraine. Retrieved 28 December 2007. ^ Remy, Johannes (1996). "'Sombre anniversary' of worst nuclear disaster in history – Chernobyl: 10th anniversary". UN Chronicle (findarticles.com). http://findarticles.com/p/articles/mi_m1309/is_n2_v33/ai_18795971. Retrieved 16 December 2007. ^ "'Fukushima, Chernobyl and the Nuclear Event Scale'". http://www.nei.org/resourcesandstats/publicationsandmedia/insight/insightsummer2011/fukushima-chernobyl-and-the-nuclear-event-scale/. ^ "Geographical location and extent of radioactive contamination". Swiss Agency for Development and Cooperation. http://www.chernobyl.info/index.php?navID=2. (quoting the "Committee on the Problems of the Consequences of the Catastrophe at the Chernobyl NPP: 15 Years after Chernobyl Disaster", Minsk, 2001, p. 5/6 ff., and the "Chernobyl Interinform Agency, Kiev und", and "Chernobyl Committee: MailTable of official data on the reactor accident") Retrieved on 2008-01-27. ^ "IAEA Report". In Focus: Chernobyl. http://www.iaea.org/NewsCenter/Focus/Chernobyl/. Retrieved May 31, 2008. ^ "Declaration of State Sovereignty of Ukraine". Verkhovna Rada of Ukraine. July 16, 1990. http://gska2.rada.gov.ua:7777/site/postanova_eng/Declaration_of_State_Sovereignty_of_Ukraine_rev1.htm. Retrieved September 12, 2007. ^ "Verkhovna Rada of Ukraine Resolution On Declaration of Independence of Ukraine". Verkhovna Rada of Ukraine. August 24, 1991. http://gska2.rada.gov.ua:7777/site/postanova_eng/Rres_Declaration_Independence_rev12.htm. Retrieved September 12, 2007. ^ "Soviet Leaders Recall 'Inevitable' Breakup Of Soviet Union". RadioFreeEurope. December 8, 2006. http://rferl.org/featuresarticle/2006/12/14b6b499-9eb2-4dee-b96c-784ec918969a.html. Retrieved September 12, 2007. ^ "Ukrainian GDP (PPP)". World Economic Outlook Database, October 2007. International Monetary Fund (IMF). http://www.imf.org/external/pubs/ft/weo/2007/02/weodata/weorept.aspx?sy=1992&ey=2008&scsm=1&ssd=1&sort=country&ds=.&br=1&c=926&s=PPPGDP&grp=0&a=&pr1.x=41&pr1.y=2. Retrieved March 10, 2008. ^ "Can Ukraine Avert a Financial Meltdown?". World Bank. June 1998. http://www.worldbank.org/html/prddr/trans/june1998/ukraine.htm. Retrieved December 16, 2007. ^ Figliuoli, Lorenzo; Lissovolik, Bogdan (August 31, 2002). "The IMF and Ukraine: What Really Happened". International Monetary Fund. http://www.imf.org/external/np/vc/2002/083102.htm. Retrieved December 16, 2007. ^ Aslund, Anders (Autumn 1995). "Eurasia Letter: Ukraine's Turnaround". Foreign Policy 100 (100): 125–143. DOI:10.2307/1149308. ^ "Ukraine. Country profile" (PDF). World Bank. http://devdata.worldbank.org/ict/ukr_ict.pdf. Retrieved December 16, 2007. ^ Wines, Michael (April 1, 2002). "Leader's Party Seems to Slip In Ukraine". The New York Times. http://query.nytimes.com/gst/fullpage.html?res=9502EFD9143AF932A35757C0A9649C8B63. Retrieved December 24, 2007. ^ "The Supreme Court findings" (in Ukrainian). Supreme Court of Ukraine. December 3, 2004. http://www.skubi.net/ukraine/judgment-december-3.html. Retrieved July 7, 2008. ^ "Ukraine-Independent Ukraine". Encyclopædia Britannica (fee required). Archived from the original on January 15, 2008. http://web.archive.org/web/20080115052653/http://www.britannica.com/eb/article-30090/Ukraine. Retrieved January 14, 2008. ^ "Ukraine – Relief". Encyclopædia Britannica (fee required). Archived from the original on January 15, 2008. http://web.archive.org/web/20080115052701/http://www.britannica.com/eb/article-30093/Ukraine. Retrieved December 27, 2007. ^ "Cybertruffle's Robigalia – Observations of fungi and their associated organisms". cybertruffle.org.uk. http://www.cybertruffle.org.uk/robigalia/eng/index.htm. Retrieved July 13, 2011. ^ "Fungi of Ukraine – potential endemics". cybertruffle.org.uk. http://www.cybertruffle.org.uk/ukrafung/eng/endelist.htm. Retrieved July 13, 2011. ^ Kottek, M.; J. Grieser, C. Beck, B. Rudolf, and F. Rubel (2006). "World Map of the Köppen-Geiger climate classification updated". Meteorol. Z. 15 (3): 259–263. DOI:10.1127/0941-2948/2006/0130. Retrieved on 2007-02-15. ^ "Ukraine – Climate". Encyclopædia Britannica (fee required). Archived from the original on January 15, 2008. http://web.archive.org/web/20080115052711/http://www.britannica.com/eb/article-30096/Ukraine. Retrieved December 27, 2007. ^ a b Віталій Портников. "Vitaly Portnykov. "Comment on the Constitutional Court of Ukraine on elimination of political reform in 2004 for Radio Liberty asked Nicholas Onischuk, former Justice Minister ... February 25, 2008 the Constitutional Court came to the conclusion that this bill can not be subject to constitutional control, but now we see that the Constitutional Court concluded that it can". 01.10.2010". Radiosvoboda.org. http://www.radiosvoboda.org/content/article/2174109.html. Retrieved October 31, 2011. ^ "Address Tymoshenko to the people: "October 1, 2010 – marks the end of Ukraine’s democracy and beginning of dictatorship". This morning the Constitutional Court of Ukraine, defying all logic of constitutional law, arbitrarily announced a new constitutional order in Ukraine. The court illegally appropriated the rights held by the people and Verkhovna Rada. Oct 01, 2010". Tymoshenko.ua. http://www.tymoshenko.ua/en/article/3o3zxoz9. Retrieved October 31, 2011. ^ Sergey Grabovsky. "Judicial absurd or Kotlyarevsky laughs again"... It turns out that "stability of the constitutional order" – it will not change his voter or even parliament, and the decision of 18 judges. 01.10.2010. ^ "General Articles about Ukraine". Government Portal. http://www.kmu.gov.ua/control/en/publish/article%3fart_id=235995&cat_id=32672. Retrieved December 24, 2007. ^ "Verkhovna Rada of Ukraine". Verkhovna Rada of Ukraine Official Web-site. http://portal.rada.gov.ua/. Retrieved December 24, 2007. ^ "Constitution of Ukraine". Wikisource. http://en.wikisource.org/wiki/Constitution_of_Ukraine. Retrieved December 24, 2007. ^ C. J. Chivers, BACK CHANNELS: A Crackdown Averted; How Top Spies in Ukraine Changed the Nation's Path, The New York Times, January 17, 2005. ^ "Teixeira: Ukraine's EU integration suspended, association agreement unlikely to be signed". Interfax. 2012-08-31. http://www.interfax.com.ua/eng/main/116043/. Retrieved 2012-09-06. ^ a b "Regions of Ukraine and their divisions" (in Ukrainian). Verkhovna Rada of Ukraine Official Web-site. http://gska2.rada.gov.ua:7777/pls/z7502/a002. Retrieved December 24, 2007. ^ a b "The history of the Armed Forces of Ukraine". The Ministry of Defence of Ukraine. http://www.mil.gov.ua/index.php?lang=en&part=history&sub=history. Retrieved July 5, 2008. ^ "Ukraine Special Weapons". globalsecurity.org. http://www.globalsecurity.org/wmd/world/ukraine/index.html. Retrieved December 24, 2007. ^ a b "White Book 2006" (PDF). Ministry of Defense of Ukraine. http://www.mil.gov.ua/files/white_book_eng2006.pdf. Retrieved December 24, 2007. ^ "Multinational Peacekeeping Forces in Kosovo, KFOR". Ministry of Defense of Ukraine. http://www.mil.gov.ua/index.php?lang=en&part=peacekeeping&sub=kfor_kosovo. Retrieved December 24, 2007. ^ "Peacekeeping". Ministry of Defense of Ukraine. http://www.mil.gov.ua/index.php?part=peacekeeping&lang=en. Retrieved May 2, 2008. ^ "Declaration of State Sovereignty of Ukraine". Verkhovna Rada of Ukraine Official Web-site. http://gska2.rada.gov.ua:7777/site/postanova_eng/Declaration_of_State_Sovereignty_of_Ukraine_rev1.htm. Retrieved December 24, 2007. ^ Child poverty soars in eastern Europe, BBC News, 11 October 2000. Retrieved on 12-01-2009. ^ "Independent Ukraine". Encyclopædia Britannica (fee required). http://www.britannica.com/eb/article-30078/Ukraine. Retrieved 12 September 2007. ^ "CIA World Factbook – Ukraine. 2002 edition". CIA. http://www.faqs.org/docs/factbook/print/up.html. Retrieved 5 July 2008. ^ "Ukraine - gdp". Index Mundi. http://www.indexmundi.com/facts/ukraine/gdp#NY.GDP.MKTP.PP.KD. Retrieved 15 July 2012. ^ "CIA World Factbook – Ukraine. 2004 edition". CIA. http://www.umsl.edu/services/govdocs/wofact2004/geos/up.html. Retrieved 5 July 2008. ^ "Average Wage Income in 2008 by Region". State Statistics Committee of Ukraine. http://www.ukrstat.gov.ua/operativ/operativ2008/gdn/reg_zp_m/reg_zpm08_u.htm. Retrieved 5 July 2008. ^ a b "Bohdan Danylyshyn at the Economic ministry". Economic Ministry. http://me.kmu.gov.ua/control/en/publish/article?art_id=115924&cat_id=38912. Retrieved February 1, 2008. ^ "Structure export and import, 2006". State Statistics Committee of Ukraine. http://www.ukrstat.gov.ua/operativ/operativ2005/zd/zd_rik/zd_u/gs_u.html. Retrieved 5 July 2008. ^ "Statistics of Launches of Ukrainian LV". National Space Agency of Ukraine. http://www.nkau.gov.ua/nsau/catalogNEW.nsf/mainE/731F5A089D942FA8C2256FBF002DFA78?OpenDocument&Lang=E. Retrieved 24 December 2007. ^ "Missle defence, NATO: Ukraine’s tough call". Business Ukraine. Archived from the original on 25 March 2008. http://web.archive.org/web/20080325011150/http://www.businessukraine.com.ua/missile-defence-nato-ukraine-s. Retrieved 5 July 2008. ^ "Ukraine Special Weapons". The Nuclear Information Project. http://www.fas.org/nuke/guide/ukraine/. Retrieved 5 July 2008. ^ "Ukraine's gas sector" (PDF). Oxford Institute for Energy Studies. pp. 36 of 123. http://www.oxfordenergy.org/pdfs/NG21.pdf. Retrieved 5 July 2008. ^ "What are Middle-Income Countries?". The World Bank – (IEG). http://web.worldbank.org/WBSITE/EXTERNAL/EXTOED/EXTMIDINCCOU/0,,contentMDK:21453301~isCURL:Y~pagePK:64168427~piPK:64168435~theSitePK:2831368,00.html. Retrieved 3 January 2008. ^ Pogarska, Olga. "Ukraine macroeconomic situation – February 2008". UNIAN news agency. http://www.unian.net/eng/news/news-238714.html. Retrieved 29 February 2008. ^ Ballmer, Steve (20 May 2008). "Microsoft CEO Steve Ballmer Visits Ukraine". Microsoft. http://www.microsoft.com/emea/presscentre/pressreleases/BallmerVisitsUkrainePR_21052008.mspx. Retrieved 28 July 2008. ^ "Industry of Ukraine". Usndt.com.ua. http://www.usndt.com.ua/industry.htm. Retrieved 30 December 2010. ^ "Ilyushin Finance to buy 10 An-158 planes from Ukraine’s Antonov". En.rian.ru. 20 July 2010. http://en.rian.ru/business/20100720/159879889.html. Retrieved 30 December 2010. ^ "waghid1neu" (PDF). http://www.ascent-ag.ch/files/inside/ukraine/Growth%20Potential%20of%20the%20Ukrainian%20Economy%20-%20Derrer.pdf. Retrieved 30 December 2010. ^ "U.S. embassy: Ukraine could again be put on list of copyright violators". Kyivpost.com. http://www.kyivpost.com/news/nation/detail/89520/. Retrieved 30 December 2010. ^ "Ukraine’s economic growth to resume in 2010, unemployment to be high". Kyivpost.com. 17 December 2009. http://www.kyivpost.com/news/business/bus_general/detail/55329/. Retrieved 30 December 2010. ^ Bose, Mihir (7 July 2008). "The long road to Kiev". BBC. http://www.bbc.co.uk/blogs/thereporters/mihirbose/2008/07/uefa_is_happy_with_the.html. Retrieved 29 July 2008. ^ "Transportation in Ukraine". U.S. Government Printing Office. http://permanent.access.gpo.gov/lps3997/9510uktn.htm. Retrieved 22 December 2007. ^ "Consulate General of Ukraine". Ukrconsul.org. http://www.ukrconsul.org/visa/visa_drops.htm. Retrieved 30 December 2010. ^ "Kharkiv airport gets new terminal on". UEFA. 28 August 2010. http://www.uefa.com/uefaeuro2012/news/newsid=1520657.html. Retrieved 30 December 2010. ^ "Судоходная компания Укрферри. Морские паромные перевозки на Черном Море между Украиной, Грузией, Турцией и Болгарией". Ukrferry.com. http://www.ukrferry.com/. Retrieved 30 December 2010. ^ a b "Ukraine". Energy Information Administration (EIA). US government. Archived from the original on 27 March 2008. http://web.archive.org/web/20080327092522/http://www.eia.doe.gov/emeu/cabs/Ukraine/Full.html. Retrieved 22 December 2007. ^ a b "Nuclear Power in Ukraine". World Nuclear Association. http://world-nuclear.org/info/inf46.html. Retrieved 22 December 2007. ^ "Відновлювана енергетика України стрімко зростає, але досі має мізерну частку | Зелена Хвиля". Ecoclubua.com. 2012-07-29. http://ecoclubua.com/2012/01/vidnovlyuvana-enerhetyka-ukrajiny-2011/. Retrieved 2012-08-25. ^ Roca, Marc (29 December 2011). "Europe’s Biggest Solar Park Completed With Russian Bank Debt". Bloomberg. http://www.bloomberg.com/news/29-12-2011/europe-s-biggest-solar-park-completed-with-russian-bank-debt-1-.html. ^ Katya Gorchinskaya (1997-06-12). "Small business bearing the brunt of corruption". Kyivpost.com. http://www.kyivpost.com/content/business/ukraine-to-triple-solar-power-capacity-in-2012.html?goback=.gde_2326359_member_141269257. Retrieved 2012-08-25. ^ 14:53 (2012-03-27). "9% of electricity will be received from renewable sources in 2030". Ukrinform.ua. http://www.ukrinform.ua/eng/news/9_of_electricity_will_be_received_from_renewable_sources_in_2030?goback=.gde_2326359_member_103982024. Retrieved 2012-08-25. ^ "Europe Internet Usage". Internetworldstats.com. http://www.internetworldstats.com/stats4.htm. Retrieved 2012-08-25. 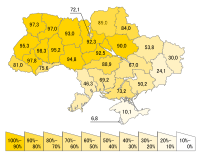 ^ "Ukraine – Statistics". United Nations Children's Fund (UNICEF). http://www.unicef.org/infobycountry/ukraine_statistics.html. Retrieved January 7, 2008. ^ "Total population, as of September 1, 2009. Average annual populations January–August 2009". State Statistics Committee of Ukraine. 2009. http://en.wikipedia.org/w/index.php?title=Ukraine&action=edit&section=27. Retrieved October 16, 2009. ^ a b "Field Listing – Population growth rate". CIA World Factbook. https://www.cia.gov/library/publications/the-world-factbook/fields/2002.html. Retrieved July 5, 2008. ^ a b "What Went Wrong with Foreign Advice in Ukraine?". The World Bank Group. http://www.worldbank.org/html/prddr/trans/julaug99/pgs3-4.htm. Retrieved January 16, 2008. ^ (2005) "The Path to Lowest-low Fertility in Ukraine". Population Studies 59 (1): 55–70. DOI:10.1080/0032472052000332700. PMID 15764134. ^ "President meets with business bosses". Press office of President Victor Yushchenko. Archived from the original on December 14, 2007. http://web.archive.org/web/20071214153647/http://www.president.gov.ua/en/news/data/1_21296.html. Retrieved February 1, 2008. ^ "Linguistic composition of the population". All-Ukrainian population census, 2001. Archived from the original on January 5, 2008. http://web.archive.org/web/20080105092304/http://www.ukrcensus.gov.ua/eng/results/general/language/. Retrieved January 27, 2008. ^ Schwirtz, Michael (July 5, 2012). "Ukraine". The New York Times. http://topics.nytimes.com/top/news/international/countriesandterritories/ukraine/index.html. ^ "Світова преса про вибори в Україні-2004 (Ukrainian Elections-2004 as mirrored in the World Press)". Архіви України (National Archives of Ukraine). http://www.archives.gov.ua/Sections/Revolution_2004/UKL/photos.php?UKL302. Retrieved January 7, 2008. ^ Linguistic composition of population Autonomous Republic of Crimea, 2001 Ukrainian Census. Retrieved on 2008-01-27. ^ For a more comprehensive account of language politics in Crimea, see Natalya Belitser, "The Constitutional Process in the Autonomous Republic of Crimea in the Context of Interethnic Relations and Conflict Settlement," International Committee for Crimea. Retrieved August 12, 2007. ^ a b c d e "State Department of Ukraine on Religious". 2003 Statistical report. http://web.archive.org/web/20041204115821/www.derzhkomrelig.gov.ua/info_zvit_2003.html. Retrieved January 27, 2008. ^ "Ukrainian Greek Catholic Church (UGCC)". Archived from the original on February 26, 2008. http://web.archive.org/web/20080226124455/http://www.ugcc.org.ua/eng/ugcc_history/definition/. Retrieved January 27, 2008. ^ "Kiev Saint Sophia Cathedral". United Nations Educational, Scientific and Cultural Organisation (UNESCO). UN. http://whc.unesco.org/en/list/527. Retrieved July 8, 2008. ^ "Caught Between East and West, Ukraine Struggles with Its Migration Policy". By Olena Malynovska. National Institute for International Security Problems, Kiev. ^ "International Religious Freedom Report 2007 – Ukraine". United States Department of State (USDOS). http://www.state.gov/g/drl/rls/irf/2007/90205.htm. Retrieved January 27, 2008. ^ Jews. Encyclopedia of Ukraine. ^ "Опитування: Віруючим якої церкви, конфесії Ви себе вважаєте? // Центр Разумкова". Razumkov.org.ua. http://razumkov.org.ua/ukr/poll.php?poll_id=300. Retrieved 2012-08-25. ^ (2002) "A New Estimate of Ukrainian Population Losses During the Crises of the 1930s and 1940s". Population Studies 56 (3): 249–264. DOI:10.1080/00324720215934. ^ Malynovska, Olena, Caught Between East and West, Ukraine Struggles with Its Migration Policy, National Institute for International Security Problems, Kiev, January 2006. Retrieved on 2008-07-03. ^ "International migration 2006". United Nations Department of Economic and Social Affairs. http://www.un.org/esa/population/publications/2006Migration_Chart/2006IttMig_wallchart.xls. Retrieved July 5, 2008. ^ "Medical Care in Ukraine. Health system, hospitals and clinics". BestOfUkraine.com. May 1, 2010. http://bestofukraine.com/travel-essentials/medical-care.html. Retrieved December 30, 2010. ^ Ukraine. "Health in Ukraine. Healthcare system of Ukraine". Europe-cities.com. http://www.europe-cities.com/en/633/ukraine/health/. Retrieved December 30, 2010. ^ "General secondary education". Ministry of Education and Science of Ukraine. Archived from the original on October 16, 2007. http://web.archive.org/web/20071016104343/http://education.gov.ua/pls/edu/docs/common/secondaryeduc_eng.html. Retrieved December 23, 2007. ^ "Higher education in Ukraine; Monographs on higher education; 2006" (PDF). http://unesdoc.unesco.org/images/0014/001465/146552e.pdf. Retrieved December 30, 2010. ^ "System of Higher Education of Ukraine". Ministry of Education and Science of Ukraine. Archived from the original on December 17, 2007. http://web.archive.org/web/20071217073746/http://www.education.gov.ua/pls/edu/docs/common/higher_educ_eng.html. Retrieved December 23, 2007. ^ "System of the Education of Ukraine". Ministry of Education and Science of Ukraine. Archived from the original on December 12, 2007. http://web.archive.org/web/20071212111804/http://www.education.gov.ua/pls/edu/docs/common/education_eng.html. Retrieved December 23, 2007. ^ "Cultural differences". Ukraine's Culture. http://www.tryukraine.com/society/cultural_differences.shtml. Retrieved January 27, 2008. ^ "Interwar Soviet Ukraine". Encyclopædia Britannica (fee required). http://www.britannica.com/eb/article-30078/Ukraine. Retrieved September 12, 2007. "In all, some four-fifths of the Ukrainian cultural elite was repressed or perished in the course of the 1930s"
^ "Gorbachev, Mikhail". Encyclopædia Britannica (fee required). Archived from the original on June 22, 2008. http://web.archive.org/web/20080622041436/http://www.britannica.com/eb/article-9037405. Retrieved July 30, 2008. "Under his new policy of glasnost (“openness”), a major cultural thaw took place: freedoms of expression and of information were significantly expanded; the press and broadcasting were allowed unprecedented candour in their reportage and criticism; and the country's legacy of Stalinist totalitarian rule was eventually completely repudiated by the government"
^ "Pysanky – Ukrainian Easter Eggs". University of North Carolina. http://www.cs.unc.edu/~yakowenk/pysanky/index.html. Retrieved July 28, 2008. ^ a b c d e "Ukraine – Cultual Life – Literature". Encyclopædia Britannica (fee required). http://www.britannica.com/eb/article-30082. Retrieved July 3, 2008. ^ a b c "Ukraine – Literature". Ukraine – Literature. http://encarta.msn.com/encyclopedia_761573617_4/Ukraine.html. Retrieved July 3, 2008. ^ Struk, Danylo Husar. "Literature". Encyclopedia of Ukraine. http://www.encyclopediaofukraine.com/display.asp?AddButton=pages\L\I\Literature.htm. Retrieved January 17, 2008. ^ "Project of reconstruction of the Rybalskyi Peninsula" (in Russian). archunion.com.ua. December 5, 2005. http://archunion.com.ua/gradsovet_05_12_07.html. ^ "Travel to Ukraine. Ukraine country guide, information about Ukraine. Visit Ukraine, places, tourism, tours". Ua-travelling.com. http://ua-travelling.com/en/article/Ukrainian-clothes. Retrieved December 30, 2010. ^ "Рівненська обласна державна адміністрація – Обласний центр народної творчості". Rv.gov.ua. http://www.rv.gov.ua/sitenew/main/ua/1160.htm. Retrieved December 30, 2010. ^ "ПІСНІ ТА ВИШИВКИ УЛЯНИ КОТ – Мистецька сторінка". Storinka-m.kiev.ua. http://storinka-m.kiev.ua/article.php?id=478. Retrieved December 30, 2010. ^ "Ukraine – Sports and recreation". Encyclopædia Britannica (fee required). Archived from the original on January 15, 2008. http://web.archive.org/web/20080115053121/http://www.britannica.com/eb/article-30127/Ukraine. Retrieved January 12, 2008. ^ Trophies of Dynamo – Official website of Dynamo Kyiv (Ukrainian). Retrieved June 23, 2008. ^ International Olympic Committee. "Mr. Sergey BUBKA". Official website of the Olympic Movement. http://www.olympic.org/en/content/The-IOC/Members/Mr-Sergey-BUBKA/. Retrieved May 27, 2010. "... voted world's best athlete on several occasions." ^ "Track and Field Athlete of the Year". Trackandfieldnews.com. http://www.trackandfieldnews.com/archive/aoy.html. Retrieved January 30, 2011. ^ Stechishin, Savella. "Traditional Foods". Encyclopedia of Ukraine. http://www.encyclopediaofukraine.com/pages/T/R/Traditionalfoods.htm. Retrieved August 10, 2007. Cliff, Tony (1984). Class Struggle and Women’s Liberation. Bookmarks. ISBN 0-906224-12-8. Kohut, Zenon E.; Nebesio, Bohdan Y.; and Yurkevich, Myroslav. Historical Dictionary of Ukraine. Scarecrow Press, 2005. 854 pp. Roberts, Geoffrey (2006). Stalin's Wars: From World War to Cold War 1939–1953. Yale University Press. ISBN 0-920862-37-3. Weinberg, Gerhard L (1995). A World at Arms: A Global History of World War II. Cambridge University Press. ISBN 0-521-55879-4. This page uses content from the English language Wikipedia. The original content was at Ukraine. The list of authors can be seen in the page history. As with this Familypedia wiki, the content of Wikipedia is available under the Creative Commons License.